“I want to show you something,” Roberto Zambrano declared one day when we were driving back from lunch (the best pepitos in Venezuela, for those in the know) during my last trip to Acarigua. He took a turn off the main road that constituted the usual route to the núcleo, passed through some quiet side streets and eventually drove into a grassy field bounded by low-rise residential areas. At the centre of these grounds were a few institutional-looking grey buildings, all about three stories in height, all grim concrete edifices. Roberto and I left the vehicle at the edge of a large pavilion of flagstones leading toward the entry, a multi-story glass wall flanked by concrete columns. Through the inset glass doors a connecting courtyard or foyer was revealed, the late afternoon sun illuminating the space within through the skylights in the roof. Then Roberto surprised me. “One day I would like this to be our núcleo,” he said. Roberto is a man of rare vision, action and integrity within the Fundación, but this particular challenge may well be beyond even him. These buildings, originally started as part of a new university development, had been abandoned in mid construction some years earlier. The gaping windows, overgrown courtyard and surroundings and complete abandonment gave a grim impression of post-apocalyptic decay, not a bright musical future. Admittedly, the courtyard would make an admirable performance venue, the classrooms could be reconfigured to practice or rehearsal rooms, with the entirety constituting a tremendous upgrade on the existing facility of a dilapidated house – but demanding a directly proportional amount of money and effort to achieve as well. So when Geoff Baker questions the planned disposition of the $350 million loan from the CAF to the Fundación, and speculates on the alternative of an allocation of more than $1 million to each of the núcleos across the nation, I have direct, personal knowledge of the good those funds could do thus disbursed, of the positive impact even a fraction of the amount could have in a small town in the middle of Los Llanos. But the bigger picture may not be so simple. Those incomplete buildings in a field in Acarigua may represent unfulfilled potential, but they also symbolize the fickle nature of government funding: breaking ground and building one day, complete abandonment the next. In recent years the Fundación has benefited enormously from the support of Hugo Chavez and high international oil prices, but the program’s leadership surely knows that neither can last forever. Both President and commodity are currently in decline: the former enough so that he has openly nominated a successor for the first time since he began his battle with cancer. There is no guarantee that subsequent administrations will support the work of the Fundación to the same extent, so planning for a leaner future would be the most sensible option. And a leaner future implies greater self-sufficiency on the part of the Fundación, which means investing now in the infrastructure to ensure it has the capacity to earn some revenue later. I can only speculate how this might be accomplished, through such activities as print and digital media publications, or training facilities and residences for international visitors. Centralization in this case might be essential. With the loan (not a grant) and concomitant conditions of use from the CAF, the Fundación has greater assurance of the facilities being completed than if the government were to allocate the funds directly. For that matter, were I in a leadership position at the Fundación, I would have a private agenda of securing what funding I could, gifted or loaned, for capital projects. Any sums received would be invested in land, as consistent with the purposes for which the monies were solicited. Should the levels of government support remain stable, I would proceed with facility development…and should funding drop, I would have a large reserve of cash held in an inflation-proof vehicle. (Current inflation stands at 18%, down from 27% at the start of the year.) It would be the perfect savings account for the proverbial rainy day, with consideration to the political and economic optics. The stands truly are awful. Naturally this is purely speculative on my part, and no one from the Fundación would ever confirm the existence of such an agenda. But they must be mindful of the future in an unstable political and economic context, and they need to ensure that programming continues to be executed, even in garden sheds or the (apocryphal?) abandoned bank. The Fundación’s programming is people-driven, not facility-driven. It has an uncommonly narrow and specific mandate that demands human resources more than bricks and mortar: the history of the organization is proof enough of that. 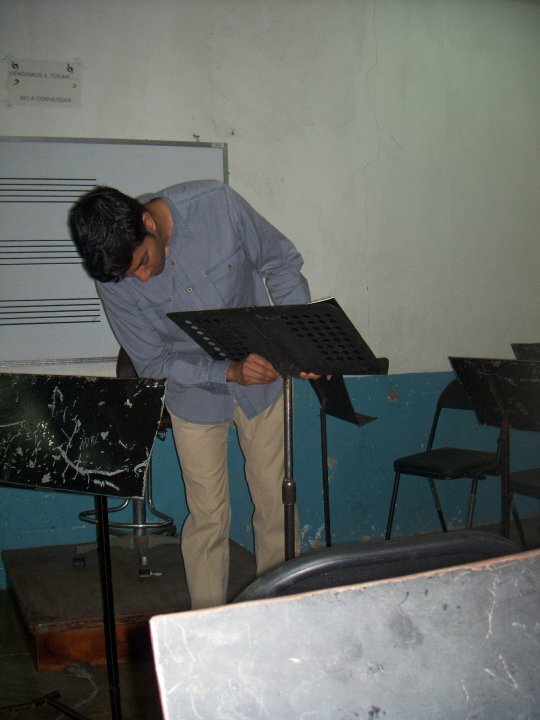 While I would love to see a decent facility in Acarigua – while I would love to see them retire the unstable, home-made music stands they currently have – they can get by in their decaying house with intermittent air-conditioning and rusting equipment. They can’t do without their faculty, which is what the Fundación pays for. ← Grant Opportunity for new El Sistema Programs!